As states have taken over the job of developing their own K-12 assessment systems, many stakeholders have learned how difficult it is to create high quality assessment tools that can measure the complex thinking and authentic learning aspects of 21st century education. 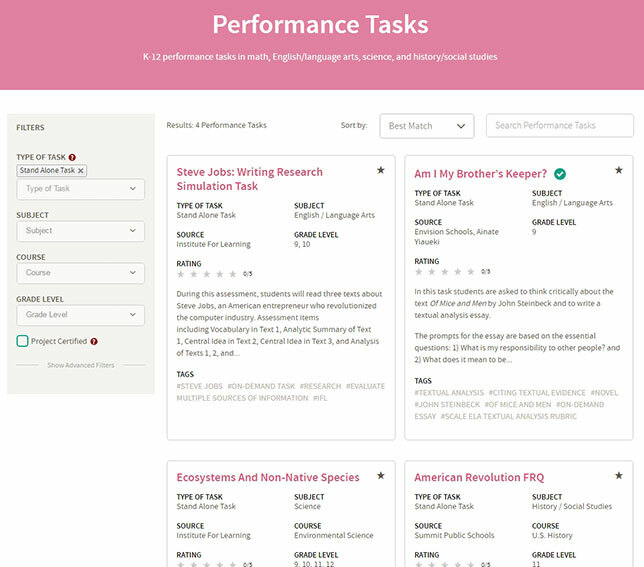 To address the challenge, the Stanford Graduate School of Education recently opened a free, online collection of high-quality tasks and resources that support the use of performance assessment. The collection, named the "Performance Assessment Resource Bank," currently has 326 different objects. The work was undertaken by the Understanding Language and Stanford Center for Assessment, Learning and Equity (UL-SCALE) and the Stanford Center for Opportunity Policy in Education (SCOPE) as well as the Council of Chief State School Officers's Innovation Lab Network. Both of the Stanford centers work with schools, districts, states and teacher training programs to provide direct support in task design, implementation and scoring. The innovation lab is made up of a group of states seeking to scale education innovation in student-centered learning. The contents have come from educators and organizations across the country. All have been vetted by experts in the field affiliated with the two Stanford centers. Community members may register on the site to create their own dashboards, share resources via social channels and rate content to facilitate continuous improvement. "Educators need higher quality assessment tools that measure the complex thinking necessary for success in our modern world," said Linda Darling-Hammond, Stanford professor emerita of education, in a statement. That's why we're launching the Performance Assessment Resource Bank." The goal, she added, is to provide "an expanding resource base through community collaboration and sharing, all focused on more meaningful learning." The Performance Assessment Resource Bank is available at performanceassessmentresourcebank.org.